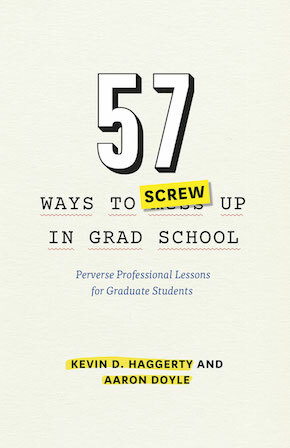 Kevin D. Haggerty and Aaron Doyle’s 57 Ways to Screw Up in Grad School generated quite a buzz. The book, written by two former graduate directors, covers the rookie mistakes made by new graduate students and delivers a how-to guide that sets would-be PhDs on the right track and off the path to failure—which these days includes a only 50 percent completion rate. The authors’ have a bang-up website, the aptly named gradscrewups.com, and the book has recently been profiled by Inside Higher Ed, Science, and CBS News’s Money Watch. To whet your appetite, here’s an excerpt from a recent piece at the THE, after the jump. Students eager to screw up should remember that their thesis is their defining personal and professional achievement. The thesis is everything. Therefore, it should contain everything. Approach your topic from every conceivable angle. Use a diverse set of methodologies. Explore the topic from every theoretical framework conceivable. Aim to produce an analysis that spans the full sweep of human history. This will ensure that in 30 years you will be asking whether you are eligible for pension benefits as a graduate student. As we parted, I thought to myself: “He’s right. This is insane. I will never be able to do all of this.” The project was massive, unfocused, and had to be radically reduced in scope and ambition or I would never finish. I slept horribly that night, but my fear motivated me to transform my thesis into something more feasible. Master’s and PhD students tend to set overly ambitious parameters for their research, mistakenly thinking that their thesis has to be a monumental contribution to knowledge. The jazz trumpeter Dizzy Gillespie famously said that it took his whole life to learn what not to play. The same is true for designing and writing academic works. You need to identify what not to cover in your research, and you must remove tangents peripheral to your analysis or argument. You might have to cut major sections or even chapters. This will hurt. I cut many pages of material in the final stages of writing my master’s thesis, including a number of chunks that I loved but which did not quite fit with my final structure and arguments. A thesis, like any written work, is always stronger when you omit unnecessary sections. Simply place those parts in a separate file and work them up later for a submission to a journal. To read more about 57 Ways to Screw Up in Grad School, click here.